Starting at Rs 34,999, a product with latest Qualcomm Snapdragon 845 processor, 6GB RAM with 64GB storage, dual camera setup, posh design with a premium glass back, does not belong to any group. Starting at Rs 34,999, a product with latest Qualcomm Snapdragon 845 processor, 6GB RAM with 64GB storage, dual camera setup, posh design with a premium glass back, does not belong to any group. Calling it a flagship killer would be placing it in a category of flagship killers, which is an understatement by a mile. At the risk of sounding blasphemous, I say OnePlus with the launch of 6, is rewriting history by creating a whole new category that will carve a niche for itself. Straight off the bat, OnePlus 6 looks stunning with an all-glass design. Well rounded at the corners, a curved back, the ergonomically placed fingerprint sensor, the dual camera set-up that looks like staring in the face of a vertical double-barrel, and the proprietary alert slider button all add up to this incredible design that feels like holding a cloud in your hands. But it is slippery, and the glass body is protected by one of the toughest in the business, the Corning Gorilla Glass 5. However, OnePlus 6 missed out on the opportunity to embed wireless charging capability, which is unfortunate but not a deal breaker. The curved design perfectly shows-off the 6.28-inch 2280X1080 resolution display with 19:9 aspect ratio, that makes the screen one of my favourites for playing video games and watching videos. It also crowns a smaller notch on the top centre of the display, offering a slightly bigger screen than most of the devices bitten by the notch-fever. Even though OnePlus hasn't used an OLED screen, the AMOLED display with 2280x1080p resolution feels bright, punchy and offers great colour reproduction. The proprietary alert notification slider has now been moved to the right, just above the power button, the left side of panel houses the volume button and the SIM tray, and at the bottom rest the speaker, Type-C charging port and a 3.5mm audio port. Expectations run high and rightly so from this vertical double-barrel styled dual-camera setup with a 16-megapixel Sony IMX 519 sensor, f/1.7 aperture main, and a 20-megapixel Sony IMX 376K sensor, f/1.7 aperture secondary camera. The Oxygen OS based on Android 8.1.0 looks polished and comes with some really neat features and can be upgraded to the Android P beta version too. 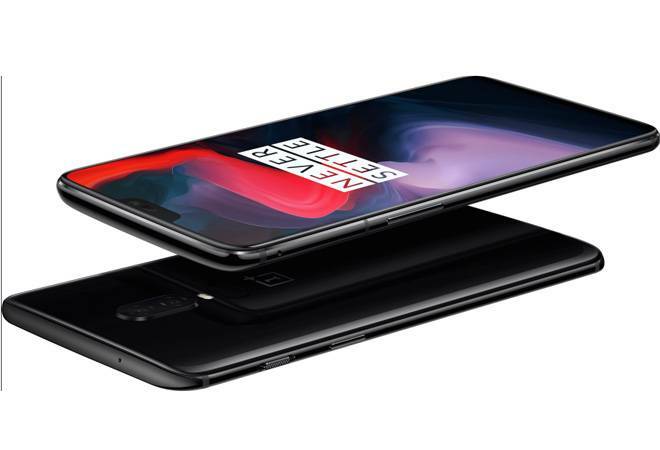 OnePlus 6 is available in the deep dark black colour christened as 'mirror-black' and 'mid-night' black, and a premium looking 'silk-white' having crushed pearl power. As mentioned above, the base variant comes with 6GB RAM and 64GB storage for Rs 34,999 and for Rs 5,000 more, you can get the second variant with 8GB of RAM and 128GB storage for Rs 39,999. And then there is the OnePlus 6 Avengers Limited Edition, which is a little more than just an Avengers logo. This limited edition is manifested by a carbon-fiber styled pattern dubbed as "Kevlar-style"on the back, which is accentuated by the OnePlus and Marvel Avengers logos adorning a shimmering gold colour along with a alert notification slider dipped in a similar subtle gold trim. This is the superhero of the OnePlus 6 series that comes in a 8GB RAM with 256GB storage config, an Iron-Man themed protective back cover, and your own one-of-six Infinity medals. You can team up with other OnePus 6 owners to unlock all 6 Infinity medals and stand a chance to win an adventure trip to Dubai's IMG World of Adventure featuring Marvel Zone. At this price point and hardware under the hood, it doesn't take a genius to figure that OnePlus will give every other brand a run for its money. Expect a detailed analysis of the camera, gestures, performance and tests in a week's time.